Did you ever notice that the scales of a pine cone look similar in shape to the petals of a flower? What a great natural element to use in creating floral embellishments. I have been wanting to use pine cones in a craft project and turning them into flowers seemed like the best idea to me. I’ll show you how to make a rustic picture frame using pine cone petals. In this particular project, I am embellishing an unfinished picture frame. 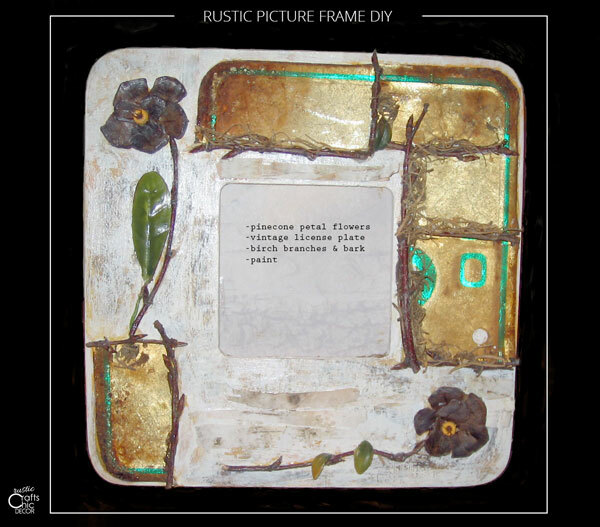 I decided to add some antique license plate pieces to the frame as well to incorporate a recycled material. Mixing up the elements also makes the finished piece a little more whimsical. I purchased my pine cones from a craft supply store, at a discount, since they were considered a seasonable item. This is a great item to pick up after the holidays. Pine cones are also fairly easy to find in some areas. I have used pine cones, that I found in the woods, before in crafts. All you need to do is bake them in the oven at a very low temperature for about an hour or so to dry them out. Make sure to use an old cookie sheet to place them on because they will ooze some sap. After drying, I like to spray the pine cones with a satin finish polyurethane to seal and protect them. Starting at the base of the pine cone, start clipping off all of the “petals” with the floral cutters. You will end up with a lot of pieces that maybe don’t look so pretty – that is okay. Once you start laying out your petals on the picture frame, you will see that they start to take shape. The rough edges of some overlap with clean edges. Play around until you have an idea of a design that you like. Now you can start gluing each piece down with your tacky glue. You have plenty of time to move things around. When you are happy with how everything is glued, you can decide if you want to further embellish the center. Beads are a great way to add color. Size up the length of stem you want for your flower and clip a section of birch twig. Pick a twig that will flow with your design the way you would like it to. Glue the twig in place. If you would like to further embellish like I did, then cut up some sections of an old rusted license plate. An old plate will give you more of a rustic look. I had to purchase my plates from an antique mall. Use a good tin snips to cut the plate and then use a metal file to smooth any jagged edges. Line your pieces up on your frame in a design that you like. Hot glue the pieces in place. Glue birch twigs at all of the seams for a clean and artsy look. You now have a finished product ready for your favorite picture! If you would like to paint your picture frame first, try a weathering technique for a cool look. First, paint the wood with one or two colors of a base coat with acrylic paint and let dry. Next, apply a generous coat of Weathered Wood, which you can buy from a craft supply store. Once dry, apply a thin layer of contrasting paint. This top coat will go on unevenly and crackle somewhat. Finish it with a layer of varnish. I also glued a few random pieces of birch bark for added affect.